Our preview forecasts the futures of the Hawks, Heat, Wizards and the rest of the Southeast Division in 2015–16. Almost every team in the Southeast Division has reached its own version of a crossroads. With big contract and coaching decisions in the near future, this season will figure largely into how these teams move going forward. For the moment, there are solid teams with professional players up near the top and growing teams with undeveloped talent near the bottom. In short, everyone is good but no one is great. This is a problem for teams that have reached about as high a perch as can be expected from their current rosters, and that statement applies to most of the division. The Hawks, Heat and Wizards are all led by All-Star performers, but it's hard to pick out one that can contend for the East and actually give the West a run for its money in the NBA Finals, a feat that would first require a team to take down the Cavaliers or Bulls. So similar to most in the East, the Southeast Division is made up of teams playing for the postseason but not necessarily a title. But how do all five teams look heading into 2015–16? Let's dive into our season preview. • Atlantic Division preview: Can anyone challenge the Raptors? Outlook: One year later and one key starter down, the Hawks remain one of the favorites to compete against Cleveland in the Eastern Conference. And while there is an obvious chasm between the two—as illustrated in last year's postseason—Atlanta retains much of a team that won 60 games last season. DeMarre Carroll is off to Toronto, but Tiago Splitter will fill that empty slot and move Atlanta into more of a traditional lineup at times, with franchise stalwart Al Horford playing some power forward before he hits free agency. Small roster shuffles aside, the Hawks are still one of the surest bets in the East. Best case: With much of their roster still intact, the Hawks use their team-first approach to play well enough to meet the Cavaliers in the Eastern Conference finals. Worst case: Disrupted by the departure of DeMarre Carroll, Atlanta fails to recapture its 2014–15 form and regresses to the middle of the East. Outlook: No one truly knows what to expect from Miami. It's hard to forecast how Chris Bosh will play after missing 40 games with blood clots, or whether Dwyane Wade's one-year deal will motivate him to play harder. There are more questions than answers at this point and one major qualifier: the Heat are as good as anyone when healthy. Now, the question is whether Bosh, Wade and Josh McRoberts can each put together a healthy season and compete with the Cavaliers, Bulls and Hawks in the East. They certainly have the talent and coaching to do so. Best case: This group’s ceiling is just as high as any in the league, and a bill of good health could land them in contention for the East, along with Cleveland and Chicago. Worst case: If each critical break goes against the Heat, they could end up in a situation similar to last year’s lottery season, when Bosh, Wade, Luol Deng and McRoberts combined to miss 137 games. Outlook: This is a make or break season for the Wizards as constructed for several reasons. 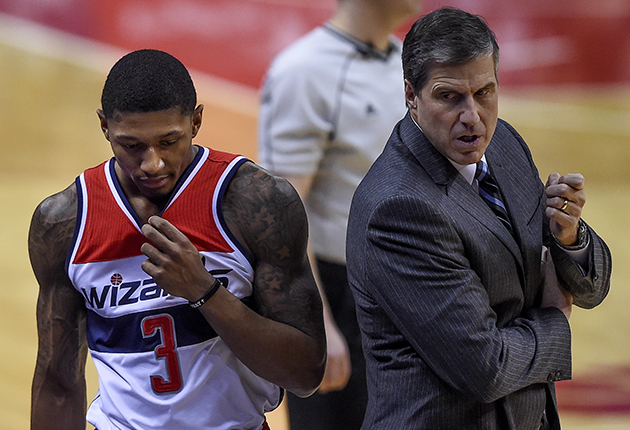 Young star Bradley Beal will play for a contract, Randy Wittman will need to secure his job by helping Washington take the next step, and players like Nene are nearly aged out of their best years. Paul Pierce's move to the Clippers also puts John Wall into a full-time leadership position and places the onus on Otto Porter to mature at an accelerated pace. For Washington, either this pressure will propel it further than many expect this season or lead the franchise back to the drawing board with only Wall and Beal in tow. Best case: Wall and Beal, who together form one of the best backcourts in the NBA, carry the load for the Wizards and help them land solidly in the postseason without any major detours. Worst case: Problems with the Wizards backcourt, which is the pillar of their attack, result in a major setback and throws Washington off its postseason track. • MORE NBA: NBA middle class | Who goes from lottery to playoffs? Outlook: As is customary, the Hornets have a ragtag roster filled with pieces jumbled together from all over the league. Look at their roster and you'll see five forwards with the same skill set and several undersized, scoring guards. Whether they make sense or not, all of these moves were made to build a team of solid shooters and adept passers around Al Jefferson. That said, Charlotte's entire season rests on Jefferson's ability to stay healthy. With him in the lineup, the Hornets could sneak into the postseason. Without him, they will land solidly in the lottery. Best case: Now that Al Jefferson is healthy and Lance Stephenson is gone, the Hornets return to their 2013–14 form, and make a push to take one of the later slots in the postseason. Worst case: The shoulder injury to Michael Kidd-Gilchrist forces the Hornets' defense to take a deep dive and Jefferson never returns to his old self, calling Charlotte's short-term future into question. Outlook: Orlando's slow build toward respectability has been an impressive one. Smart selections in the NBA draft and reasonable, patient off-seasons have helped the Magic gain steam each summer. Some have projected Orlando as a surprise team in the Eastern Conference. I wouldn't go quite that far just yet, but it's hard to imagine the collection of Victor Oladipo, Tobias Harris, Aaron Gordon, Mario Hezonja and Elfrid Payton putting forward a 20-win season. Best case: Scott Skiles’s defensive focus meshes well with a team built to hound ballhandlers and force turnovers, resulting in a jump in the Eastern Conference and potential run at a playoff spot. Worst case: Despite having the proper roster in place, the Magic fail to take the next step in their climb up the Eastern Conference ranks and finish the year with another aimless, 20-win season. Bradley Beal, Wizards. It feels like Bradley Beal has been on the brink of stardom for years at this point. During this upcoming season he could take a seismic step toward becoming the player he is expected to be. At only 22 years old, he has plenty of time to mature into a perennial All-Star. But, for the sake of his team, the pace of that progression needs to be accelerated. Beal’s smooth shooting stroke has always worked at an elite level, but if he can remain healthy, become a more consistent scorer, and be a present defender, the sky is the limit for him. Justise Winslow, Heat. There is talent among the pool of rookies in the Southeast Division, as Orlando’s Mario Hezonja, Charlotte's Frank Kaminsky and Washington's Kelly Oubre were all picked early in the first round. Miami has the most intriguing player of the bunch, though, in Winslow. He isn’t an adept three-point shooter yet, but Winslow is a strong finisher and plus defender. He also possesses a mean streak that was on display during Duke’s march to a national title in April. Randy Wittman, Wizards. Not much was expected when Wittman took over the Wizards post from Flip Saunders as an interim coach in 2011–12. He led the team to an 18–31 record under his watch and made the jump to 44–38 before losing in the Eastern Conference semifinals to the Pacers in six games. The Wizards' 2014–15 campaign netted similar results, and this team is due for a jump. Problem is, Wittman might not have the players to work with, as Otto Porter replaces Paul Pierce and the Wizards’ frontcourt continues to decline. Still, all eyes will be on Wittman as he guides the Wizards this season. Nicolas Batum, Hornets. The Hornets were criticized for trading valuable assets for Nicolas Batum, who is a free agent this summer and could walk at the end of the year. As they are wont to do, Charlotte decided to make the quick fix and move Noah Vonleh for Batum’s rights and a chance to slide into the postseason. The rising salary cap has placed more value on Batum’s versatility, and he is primed to take advantage of that. Charlotte has done well to sign its cornerstone players to favorable deals in the past. If the postseason is not in play and Batum is not playing to his full potential, expect him to hit the open market. The Hawks will win the No.1 seed. Atlanta does not have as much talent on its roster as the Cavaliers and Bulls, but both of those teams are expected to face a bit of an uphill battle to start the season. Cleveland needs to ease Kyrie Irving and Kevin Love into the fold after major injuries in the playoffs, and Chicago isn't sure when Derrick Rose will return or how he will mesh with Jimmy Butler. There is also the issue of Tristan Thompson's holdout. The Hawks have consistency on their side. They need to figure out life without DeMarre Carroll, but have enough continuity to teeter around 60 wins next season for a second time.